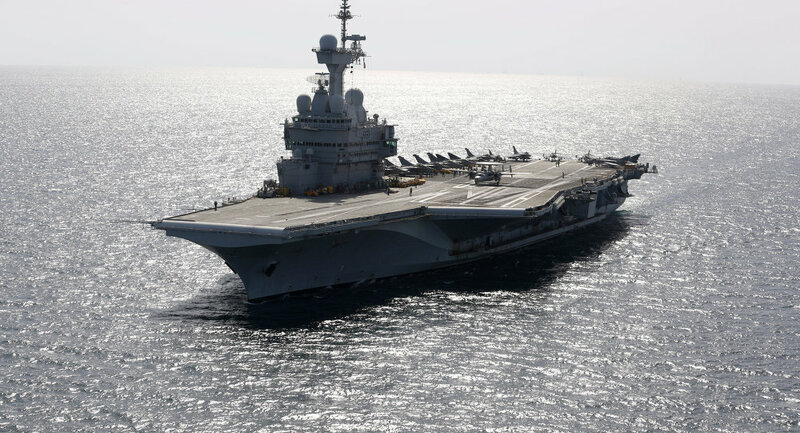 The French aircraft carrier Charles de Gaulle conducted its first mission against Daesh militants from the Persian Gulf as the flagship for Commander Task Force (CTF) 50, Defense Talk reported. The French Navy is leading carrier-based naval strike operations for Operation Inherent Resolve, the fight to defeat the Daesh (Islamic State) terrorist group. French Rear Adm. Rene-Jean Crignola, aboard the Charles de Gaulle, assumed command of CTF 50 December 7. This marks the first time the French Navy has served as commander of a US task force in the region, according to Defense Talk. CTF 50 plans to carry out airstrikes in the Middle East. The aircraft carrier and its air wing, along with other warships in the battle group, will support operations over Syria and Iraq. The battle group left its homeport of Toulon, France on November 18. The Charles de Gaulle is being escorted by the French air defense destroyer Chevalier Paul, the French anti-submarine frigate La Motte-Picquet, the Belgian anti-submarine frigate Leopold Ier, the German anti-submarine frigate Augsburg, and the French command and supply ship Marne. Touted as Western Europe's largest aircraft carrier, the 42,500-ton Charles de Gaulle can carry at least eighteen Rafale fighter jets, eight Dassault-Breguet Super Etendard carrier-born strike fighters, one Northrop Grumman E-2C Hawkeye early warning aircraft and a number of helicopters. The crew includes 1,900 sailors, pilots and mechanics. France's only aircraft carrier, the Charles de Gaulle was deployed in the Mediterranean after a November 13 series of terrorist acts in Paris saw 130 killed and over 360 injured. Daesh has claimed responsibility for the coordinated mass shootings and suicide bombings near a football stadium, in a concert hall and outside several restaurants in Paris. France is part of a coalition of 65 countries that are bombing Islamic State targets in Syria and Iraq, although they are acting without the permission of local authorities. Russia, meanwhile, is fighting alongside Syria's secular government under President Bashar al-Assad in order to secure national stability in the country.